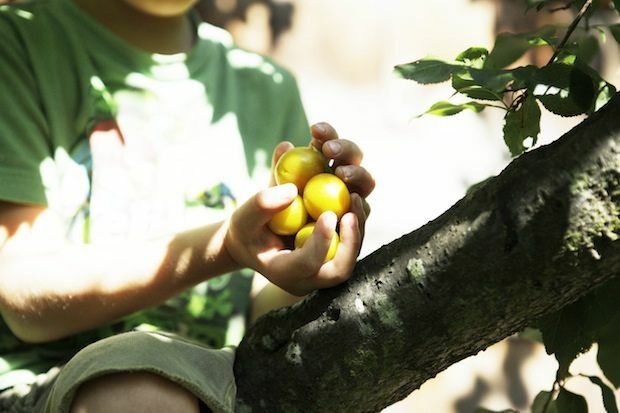 Today: Follow plums from a neighborhood tree to delectable toast. They line the streets, their sprays of blossoms lighting up the nighttime sky for a few weeks in early spring. Children shake their trunks, covering heads and shoulders and wet March sidewalks with a neon-pink petal rain. And then it’s business as usual. They seem like any old tree. We forget what’s coming. Until one morning, splat splat splat, their plums start hitting our windshields. And for the next month we are drowning in their Mirabelles, Green Gages, Santa Rosas, Burgundies, French Prunes, Satsumas, Black Ambers, Damsons. Their pits get lodged in the soles of our wedge sandals. A sticky slick from their fruits’ deep-red or yellow flesh coats the bottoms of our dogs’ paws and our sons’ Crocs. Their skins stain our rugs, lips, tongues. They inspire whipped-cream topped cobblers, crisps, grunts, buckles. And when our children are off at camp, we macerate and grill up the abundant drupes, pressing the juicy halves into beds of lemon-spiked ricotta, resting the charred goodness atop crispy grilled bread. First, taste your plums. If they’re super sour, you should probably bake them into a sweet upside-down cake. If they strike that wonderful sweet/sour balance and they’re not too soft, they’re perfect for grilling. Halve and pit them. If they’re a bit cranky in terms of pit removal, you can cut the plums in slightly unequal halves, leaving the pit intact in the larger half; then use a paring knife to extract the pit (being careful not to puncture your hand). 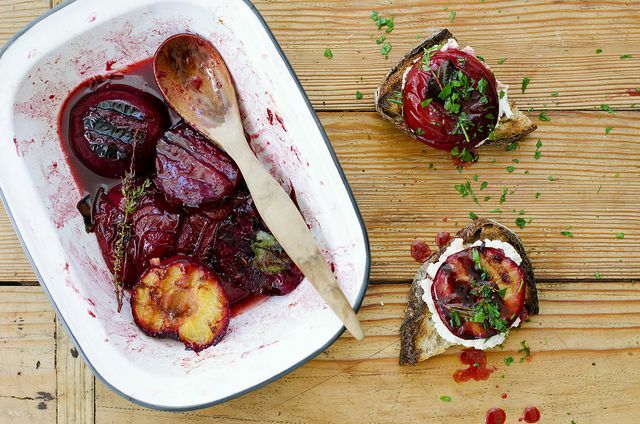 Toss the plums with a few splashes of olive oil and balsamic vinegar, a pinch of salt, and any torn fresh herbs you like (thyme, rosemary, sage, tarragon, and oregano all work well). Set aside for 30 minutes until juices starts to drizzle out. Mix the ricotta. Fancy ricotta is not required; just taste it and make sure it hasn’t soured (ricotta goes bad very quickly). Mix 3/4 cup ricotta with 1 tablespoon olive oil, the juice and zest from half a lemon, and a pinch of salt. Taste. Adjust to your liking. Set aside. Grill plums. Do this in a super hot cast iron pan or on a ridged pancake griddle or on the actual grill. Flip after about a minute. Remove from heat when they’re nicely charred on both sides and are just starting to soften. Place hot fruit back into the macerating liquid. Toast or grill some bread. Top the bread with a generous spoonful of the ricotta mixture. Press a grilled plum down into the ricotta mixture. Drizzle with coarse salt and olive oil. Sprinkle with chopped parsley. Eat. I would like to reiterate here that ricotta is one of my favorite food groups. This looks amazing! thanks, m. and i agree. ricotta is oh so special. does cafe la fortuna still exist (upper west side, 71st-ish)? i used to eat their ricotta cheesecake religiously. must develop a similar recipe. 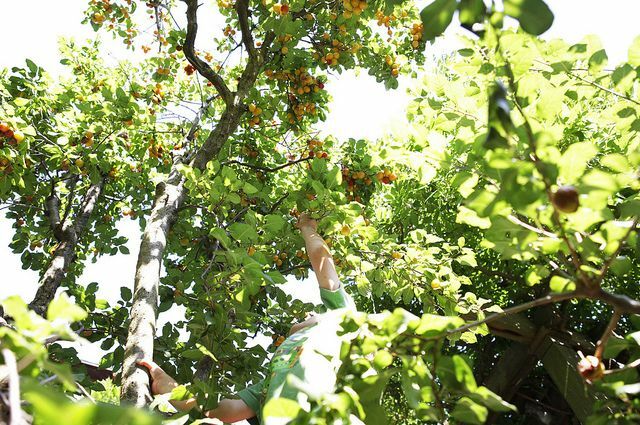 My ideal day: climbing in plum trees and ending with ricotta. you really must hang with us in berkeley. that's kinda sorta a weekly occurrence.